In this article I will share my thoughts on the Fix It Sticks T-Way Wrench, an invention of Brian Davis. It is a great tool for fanatic cyclist who maintain their bikes themselves. The Fix It Sticks T-Way is specifically designed for heavy duty (shop) use. In the latter part I will use a paragraph to look at the inventor of Fix It Sticks, Brian Davis and his entrepreneurial approach. On the long end of the Fix It Sticks T-Way you can see a small piece of aluminium tube, kept on its place by three rubber o-rings. This makes it easy to rotate the Fix It Sticks T-Way very fast between your fingers, while the design with rubber rings allows you to position the aluminium tube along the long end of the Fix It Sticks (depending on the size of your hands). Although the design is monkey proof, it is the most versatile and functional T-handle I’ve seen on the market. The Fix It Sticks T-Way comes with a total of seven 1/4″ bits: four a nice plastic cylinder and three bits in the T-Way wrench. Hex 2.5, Hex 3, Hex 4, Hex 5, Hex 6 and a Torx 25 bit. 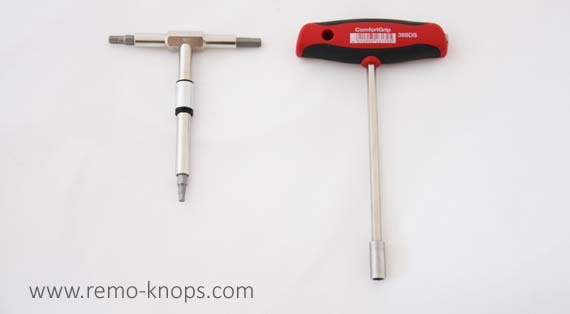 With your own set of Bosch or PB Swiss Tools bitsets the possibilities with the Fix It Sticks T-Way are limitless. The Wiha 388 DS T-Handle with comfort grip is significantly larger than the Fix It Sticks T-Way. This could give you more torque, however the comfort grip is much bigger than the small profile of the Fix It Sticks T-Way short ends. Furthermore the Wiha 388DS T-handle only supports the use of 1/4″ bits on just two ends. 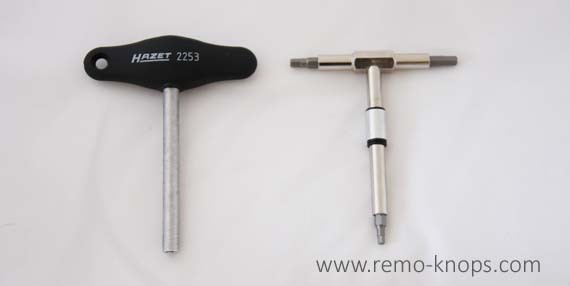 The Hazet 2253 has a similar size as the Fix It Sticks T-Way wrench. The Hazet 2253 has a bigger plastic grip, just like the Wiha 388DS T-handle. The Hazet 2253 only offers a 1/4″ bit on the long end, so you can only use it for the long reach scenario. Fix It Sticks is one of the success stories on the Small Business Development Center (SBDC) website of the University of Wisconsin Oshkosh. It provides a great summary how Fix It Sticks as a business was founded, and the type of support that Brain Davis got from a key partner like SBDC. When you use the Business Model Canvas to analyse the Fix It Sticks venture you can see that SBCD is a key partner (6) that helped analyze the cost structure (9) of Fix It Sticks. The increased media exposure covers building blocks channels (4) and customer relationships (3) in the business model canvas. Analyzing the production process focuses on the key resources (8) and key activities (7) in the business model canvas. Brain Davis also ran three successful campaigns on Kickstarter. When you look at this with the business model canvas in mind, it is really interesting to see how the crowd-funding concept like Kickstarter not only impacts the cost structure of the venture, but it also creates a new wave of exposure reaching new customers via a new customer channel. The Kickstarter BackBottle campaign is still open so you can back Brain Davis if you’d like to ! The Fix It Sticks design is really monkey proof, and the build quality and used materials are superb. The replaceable 1/4″ bits on all three ends of the Fix It Sticks T-Way really make it the most versatile tool for me. The neodymium magnets secure the bits rock solid in the T-Way ends. With a good bit-set from Bosch or PB Swiss Tools the usage scenario’s are endless. The aluminium spinner on the long end of the Fix It Sticks T-Way has again a rock solid design but is an excellent addition to the tool. The Fix It Sticks T-Way can definitely compete with well established German tool builders like Wiha and Hazet. The Fix It Sticks T-Way wrench has quickly become one of my favorite tools in my toolbox. 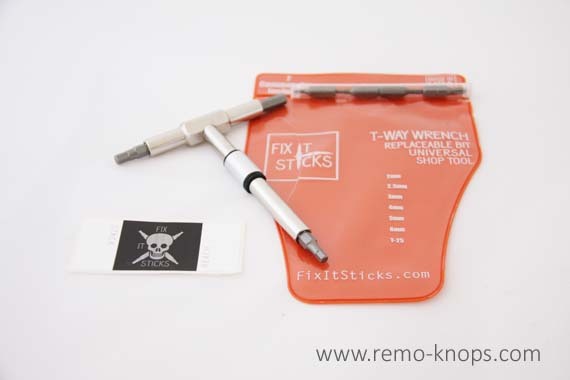 The Fix It Sticks T-Way price point of $30,- is more than reasonable for such a high quality tool. Hey!, I found this information for you: "Brian Davis Fix It Sticks T-Way review". 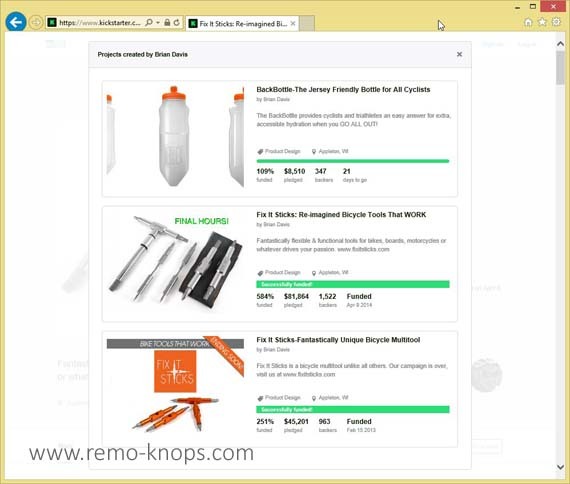 Here is the website link: https://www.remo-knops.com/5034/brian-davis-fix-it-sticks-t-way-review/. Thank you.